Want to see only @usernames on tweets? No problem. Want anabsolute time format for tweets? Sure. Missing thesquare avatars ? We got you. Wish TweetDeck's UI was a bit moreminimal? Check this out! Miss theold dark theme? You're in luck! Preferred when characters were counted withactual numbers? We hear you. All of this and a lot more is possible with Better TweetDeck! Better TweetDeck gives you access to powerful advanced features. Quickly fix your typos with the edit feature. Easily paste images to tweet them. Share any link on TweetDeck with a single click. Make your life easier with GIF preview and download. Thumbnails are a huge part of TweetDeck's experience. 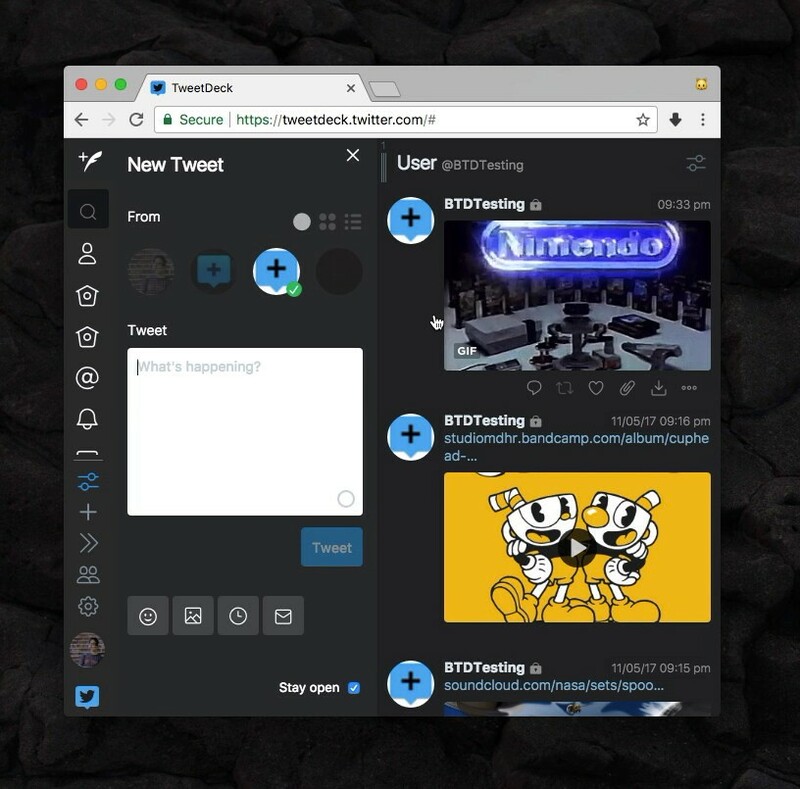 Better TweetDeck goes beyond the YouTube/Vine/Twitter limitation and adds support for more than 30 websites. 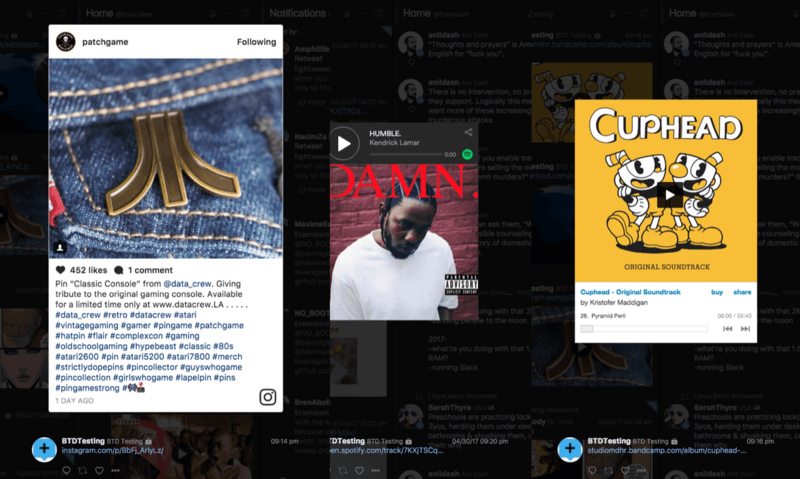 Ever wanted to preview content from Instagram, Vimeo, SoundCloud, Bandcamp, Spotify, Twitch or Imgur? Say no more! Find the perfect GIF for any occasion thanks to the Giphy/Tenor integration! 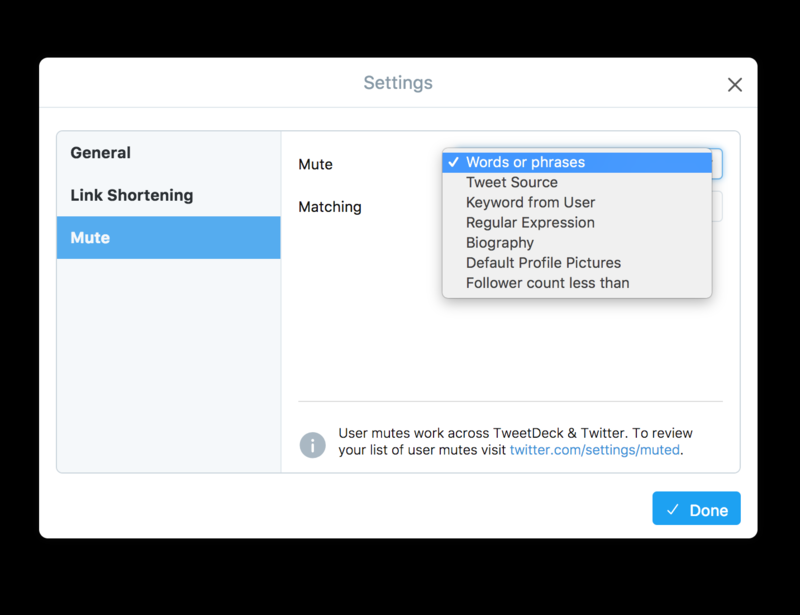 TweetDeck features already useful filters to mute users, hashtags and tweet sources. Mute tweets from a specific user if they contain specific keywords. Mute users if their biography contains a specific keyword. Mute users with the default avatar. Mute users with less than a given number of followers. Share a link or a piece of text on TweetDeck in a single right-click! No copy/pasting, only more sharing! Don't like Twitter's new reply display? Better TweetDeck got you covered! Whether you're more MM/DD/YYYY or DD/MM/YYYY or something else entirely, YOU have the control! 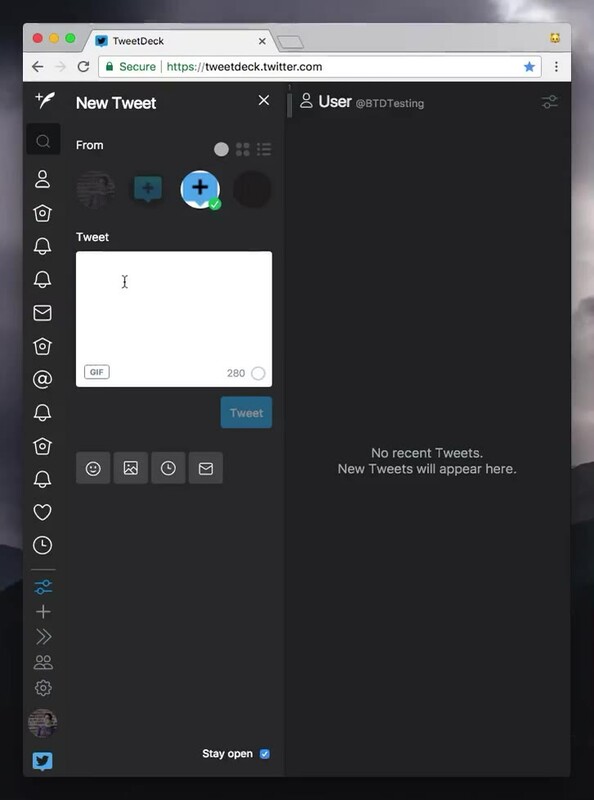 That's not a real edit, but Better TweetDeck allows you to quickly re-send a fixed version of your tweets. Quickly mute #hashtags, specific apps or be even more specific with Regular Expressions. Want to reduce tracking and/or on a slow connection? Automatically expand links in tweets. Don't want to miss a tweet or a DM? Better TweetDeck can highlight it in your browser's tab so you never miss anything. Ever wanted to get a nice GIF or video from a Twitter account? Now it's one click away! Want to avoid people peeking over your DMs? Collapse your read conversations for a little bit of privacy. You're one click away from a super-charged TweetDeck experience. Get Better TweetDeck for Chrome, Firefox or Opera.